Als Auszubildender in einer IT-Firma, die erheblichen Stellenwert auf Weiterbildung legt, sind anschauliche und gut zu verstehende Videokurse enorm wichtig. Aufgrund der vielen Prüfungen, die ich in der letzten Zeit absolvierte, sind hochwertige Videokurse angebracht, die in relativ kurzer Zeit viel Wissen verständlich vermitteln. Sehr gut gefällt mir hierbei, dass im Training wirklich von klein auf angefangen wird. Das Bedeutet, dass angefangen bei Voraussetzungen für die Installation, über die Installation bis hin zur Administration alles in übersichtlichen Schritten erklärt wird. Zudem kann man sich auf die Kompetenz des Trainers verlassen, da dieser selbst über nachweisbare Qualifikationen verfügt. J. Peter Bruzzese ist Buchautor und neben seinen anderen Qualifikationen (Triple-MCSE, MCT, MCSA, MCITP, …) ist besonders der “MVP for Exchange” hervorzuheben. Zur Beschreibung: Der Kurs ist in 40 einzelne englischsprachige Videoclips aufgeteilt, die immer ein spezifisches Segment der Exchange 2010 Architektur beleuchten. Der zeitliche Rahmen ist pro Video unterschiedlich, überschreitet aber eher selten die Stundengrenze, was dazu führt, dass es leichter fällt, dem Trainer zu folgen und die Teilbereiche besser zu verarbeiten. Zudem lassen sich somit auch kleine Zeitfenster sinnvoll ausfüllen, ohne dabei ein Video unterbrechen zu müssen. Jedes Video beginnt mit einem Überblick über die zu behandelnden Themen, worauf ein praktischer Abschnitt folgt. Im praktischen Teil wird das reelle Arbeiten mit dem Exchange Server veranschaulicht, wodurch man selbst die Situationen gut in einem Testsystem durchspielen kann, bzw. auch ohne passende Systeme anschauliche Einblicke in den visuellen Aufbau der Exchange-Architektur erhält. Hierbei erklärt J. Peter Bruzzese (Trainer) umfangreich, welche Aktion er momentan durchführt, vermittelt Hintergrundwissen und erörtert Problemstellen. Am Ende erfolgt immer eine Zusammenfassung der besprochenen Themen, die zur Rekapitulation des gesehenen dient. Überblick: Im folgenden möchte ich noch eine Zusammenfassung der Inhalte geben. In this video you will meet your instructor, you will learn about the scenario that will be used throughout the course, and you will get some advice from Peter about how to most effectively use this course. In this video you will take a high-level look at what Exchange is and how it may benefit your orginization. Plus, you will learn what the five server roles are and you will discover what’s new in Exchange 2010. In this video you will learn the details of the course scenario, that you will be working with throughout the course, to help you apply your Exchange 2010 knowledge in the “real world”. In this video you will learn about the hardware and software you will need to have in your environment to enable you to better follow along with the course. Also, you will learn how to use physical or virtual machines to build out a lab similar to the lab used in the course or a “shoe-string budget lab” that will allow you to work through the course scenarios without “breaking the bank”. In this video you will learn about the proper hardware you will need to install Exchange 2010. Plus, you will work hands-on to implement the prerequisites needed on your servers and the adjustments that are needed in Active Directory to install Exchange 2010. In this video you will work hands-on to install Exchange by performing a typical installation and a custom installation. Plus, you will walk through the installation of four different Exchange servers, including an Edge Transport Server. In this video you will work hands-on to manage Exchange using the Exchange Management Console (EMC), the Exchange Management Shell (EMS) and the Exchange Control Panel through Outlook Web App (OWA). Plus, you will work to form commands using cmdlets and you will discover how to make these cmdlets more complex and useful through a process called pipelining. 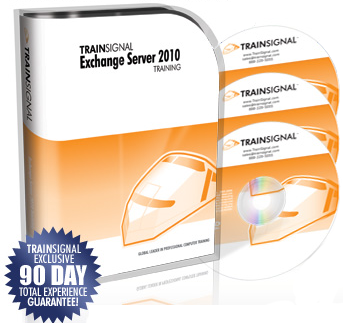 In this video you will perform a transition from Exchange 2007 to Exchange 2010. In order to do that you will discover the different elements, such as legacy host names and certificates, that will make transitioning to Exchange 2010 as smooth as possible. In this video you will learn what the Mailbox Server Role is and you will work hands-on to configure it. Now that you have your mailbox servers in place, it is important to consider the need you may have to create additional databases. In this video you will work hands-on to create and mount new databases and work to implement best practices to make sure this process is done in the most effective manner. In this video you will discover the purpose and use of Public Folders within your organization. Plus, you will work hands-on to create and configure a Public Folder database using the Public Folder Management Console and the Outlook client. In this video you will work hands-on to create new address lists based on Organizational Units. Plus, you will create new Offline Address Books; assigning one to the mailbox database and the other OAB to individuals in the OU, using the Exchange Management Shell. In this video you will work hands-on through seven different receipient projects to create the various recipient types. In this video you will learn the purpose of the Client Access Server roles, as well as the different CAS features. In this video you will create and apply Outlook Web App and ActiveSync policies. Plus, you will make virtual directory adjustments and walk through a hands-on demonstration to apply those adjustments to users in your organization. In this video you will work hands-on to setup the initial configuration of Outlook Anywhere, POP, and IMAP. Then, you will work to properly implement these different access methods based on your initial configurations. In this video you will learn about the different types of SSL certificates and you will discover the certificate type that is recommended by Microsoft. Plus, you will walk through the process of requesting a certificate from a Certificate Authority and you will work hands-on to install that certificate on your own CAS server. In this video you will discover the similarities and differences of the Hub and Edge Transport server roles. Plus, you will learn the details about several of the key transport features. In this video you will learn what send/receive connectors do automatically and you will see where you need to get involved to manually create or configure. Plus, you will discover the different types of Accepted Domains in preparation for the possibility of handling incoming mail for another company. In this video you will learn about the nine anti-spam features available on the Edge Transport server. Plus, you will work hands-on to install the anti-spam agents on a Hub Transport server in your own environment. In this video you will work hands-on to implement transport rules on the Edge and Hub Transport servers, to help protect your organization from viruses and add a disclaimer to the end of all outgoing emails. Plus, you will walk through the creation and deployment of message classifications to Outlook clients. In this video you will work hands-on to perform the Edge Subscription between the Hub Transport and Edge Tranport servers. Plus, you will work to enhance TLS security within Exchange, using MTLS. In this video you will learn how to implement the different methods that allow you to collaborate with external recipients through Federation, without using any form of trust relationship or going through a VPN connection. In this video you will learn how to configure the various recipient properties for mailbox settings. Plus, you will work hands-on to implement several real-world settings on your own mailboxes. In this video you will learn what the experts say when it comes to messaging compliance within an organization and how this will benefit you. Plus, you will discover the built-in Exchange features, as well as third-party solutions that may assist your organization with compliance. In this video you will learn how to configure both Standard and Premium journaling. Plus, you will work hands-on to turn on the personal archive feature for serveral users and see how to utilize this feature from a user’s perspective. In this video you will learn how to utilize the two different types of Messaging Records Management (MRM), Managed Folders (MRM 1.0) and Retention Tags and Policies (MRM 2.0). Plus, you will work hands-on to implement a basic managed folder plan of MRM. In this video you will learn the details of the new Role Based Access Control permissions model in Exchange 2010. Plus, you will work hands-on with the Exchange Control Panel to configure broad permission settings with predefined role groups. In this video you will learn about the hardware you need in place, as well as the configuration aspects of Exchange you will need in order to implement Unified Messaging. Plus, you will discover the best way to configure unified messaging and how to test UM once it is up and running. In this video you will work step-by-step to configure your own Unified Messaging server. In this video you will learn how Continuous Replication is used to provide High Availability in Exchange 2010. Plus, you will work hands-on to implement a Database Availability Group with three mailbox servers. In this video you will learn about the several different backup and recovery options that are available for your Exchange environment and you will discover the best disaster recovery solutions for specific situations. In this video you will work hands-on to implement different High Availability strategies for each non-mailbox server role. In this video you will learn about several considerations that you must take into account before you implement virtualization. In this video you will walk through a detailed overview of all the tools in the Exchange Toolbox. Plus, you will work hands-on with the Remote Connectivity Analyzer, Mail Flow Troubleshooter, and Queue Viewer. In this video you will learn about the different PowerShell cmdlets for the Exchange Management Shell. Plus, you will discover several practical uses for these cmdlets as you work hands-on in the EMS. In this video you will learn how to utilize the different performance analyzing and troubleshooting tools built into the Toolbox. Plus, you will work hands-on to enable diagnostic logging on your own servers. In this video you will learn Peter’s inside tips and pointers on the exam certification process and other things you should consider before taking the exam. Reaching the end of the course does not mean the learning has to end! In this video you will discover the “next steps” for continuing your growth with Exchange Server 2010. Fazit: Wie bereits der Inhaltsübersicht zu entnehmen ist, bietet der Kurs sehr viele Ressourcen an interessanten Themengebieten an. Durch den übersichtlichen Aufbau, was bei einer solchen Menge an Informationen nicht immer gegeben ist, findet man schnell etwas wieder, falls nochmal ein Thema vertieft werden soll. Somit bleiben die Videos auch für später Interessant. Ich nutze selbst diesen Kurs momentan zur Vorbereitung auf die Prüfung 70-662 und finde es sehr ansprechend, wie das Wissen anhand Grafiken, Tabellen und Beispiele lebhaft vermittelt wird. Es ist eine sehr gute Art des Lernens und kommt schon nahe an die Erfahrung des “selber Machens” heran. Deshalb kann ich diesen Kurs nur sehr weiterempfehlen. 70-662, exchange 2010 training, trainsignal, videotraining. Lesezeichen. Ich denke es in Microsoft MCSE zertifiziert. Im Wesentlichen, was ist der Job Perspektive für jemanden, der MCSE zertifiziert und MCITP? Ich höre MCSE Schule ist nun verfügbar in 14 Tagen, das ist wahr jemand?